Our hostel sits atop a quiet hill surrounded by vegetation. 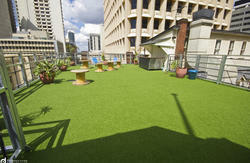 We are a family based business dedicated to Queensland and its visitors. Our staff of seven are all young people who have experienced the fun of Backpacking either here in Australia or overseas. They are here to share their experiences and to help you to get the most out of your holiday in Brisbane and Queensland..
Somewhere to stay is a huge old style Queenslander house with a lovely garden and salt water pool with a nice shaded deck. We have a variety of clean comfortable rooms ranging from singles, doubles, twins and dorm bed rooms, most of which have ensuites. We have a fantastic pool area with palm trees, Bar-B-Que and last but not least... The warm Queensland sun. We are high up on a hill overlooking the City of Brisbane with a fairyland of lights at night! 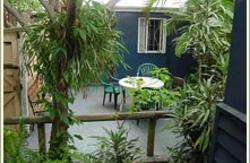 We have an excellent common room for socializing, and a cool verandah for you to sit out on and enjoy your breakfast. 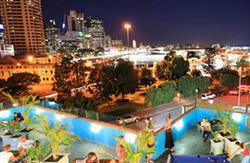 We organize night trips to the top spots in Brisbane where prices are low. When booking multiple dorm beds at short notice (1 to 3 days before booking) we cannot gaurantee all guests will be in the same room. Please contact us asap after you have book so we can try and get you and your fellow travellers in the same room together. Catch a shuttle bus called 'Coachtrans ' at the Airport and this will bring you to our door for appr $15 to $20. You may also catch the Airtrain from the airport to Roma Street Train Station or South Brisbane Station and we will pick you up from there. The train ride takes only 30 minutes and leaves every 30 minutes from the airports, very simple, fast and easy. It costs around $15. We have a free pick up from Roma Street Transit Centre hourly from 8am until 7pm. This bus does not run on public holidays. To drive from the airport is about 30 minutes. Walk to Southbank is 10 minutes, cafes and shops in West End is a short stroll.